A feature-rich, professional media and magazine theme. 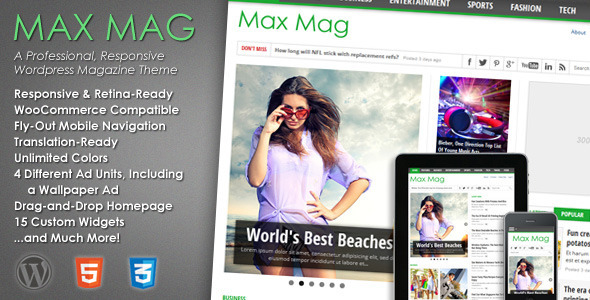 Max Mag is fully-responsive, retina-ready and Compatible with WooCommerce and bbPress. It also includes a “sticky” menu bar, a slider on each category page, 5 different ad units (including a wallpaper and mobile ad), a drag-and-drop homepage, 16 custom widgets, secondary feature headlines, SEO friendly and so much more! Responsive Design – Max Mag adjusts its layout based on the device it is being viewed on. This means the theme’s content will be easy to read and easy to navigate whether it is being viewed on a desktop computer, a tablet or a mobile device. Slider on Category Pages – No more boring category pages with a list of the most recent posts. Max Mag gives you a slider to display your most recent posts on your category pages! Post & Page Slideshows -Max Mag utilizes Theia Post Slider to give you dynamic slideshows in your posts and pages. Now, you can increase page views and ad impressions while providing excellent, organized content in a fluid slideshow. The slideshow comes with a set of options that includes the ability to reload the page with each slide to increase ad impressions. “Sticky” Menu Bar – Max Mag comes with a “sticky” menu bar that will always stay at the top of your device window as you scroll down the page for quick and easy navigation. 15 Custom Widgets – From a custom carousel widget that displays your content prominently on the homepage to an optional homepage blog layout widget, Max Mag gives you the flexibility and ease of use to display your content the way you want it without altering any code. Featured Headline – Most major news and magazine sites use shorter “teaser” headlines in their featured content section on the homepage. Max Mag gives you the same option to spruce up your featured items with a custom “teaser” headline. Congrats, MVP Themes! I’ve just started using Max Mag and it’s by far the most wonderful and the simplest theme for an online magazine (coming from my experience, since this is my third purchase on ThemeForest). Coming with Theia Slider is just wonderful because I was planning to purchase it separately. No coding skill necessary (I have none) – This is the first time I haven’t paid a third party for modifications. I am amazed and very grateful for such wonderful work. Just wanted to lay back my feedback to you! Keep up the good work, MVP Themes! Rated 5 stars – Not only did the theme give all the functionality I was looking for in a new project, more importantly the support has been fantastic. Often replies have come fast and tickets have been reopened without question where issues weren’t 100% resolved. Would be more themes from this author in the future for this alone. I rate this theme and the developer 5 stars! I just want to leave a comment and say that I’m very impressed with both this theme and the developer. I obviously don’t want to see a bunch of sites that are the same theme as mine so I never leave reviews but I can’t be quiet on this one. I had some issues NOT related to the theme but to the way my sites content is published and the developer was super faster with email support, I mean, within minutes I was getting replies and the solutions worked great! I have purchased many themes over the years from various sites and companies and for the way that this theme looks to your audience i.e not a wordpress based site and for how much you can customize this site I must tip my hat to the developer. Great job! Many themes look nice but you must have at least an intermediate understanding of the core working of wordpress to make them work, that is not the case here, you simply drag, drop, select and hit save. Literally that’s all you do for 90% of the theme! This is a brilliant theme, one of the best I have had the pleasure of installing. And whats more, the after sales service is second to none. I just want to say I am very happy with this theme, simple, fast loading, and intuitive. Congratulations to its creator and say you’ve done a great job, keep it up. Let me first congratulate you and give an absolute 5 star rating to this theme. I find the theme exactly what I needed for my magazine website. The options are great and the ease of building home page was fantastic. I have HTML knowledge not PHP , but in this theme everything was so organized it was easy for me to make the necessary changes I wanted to make. My problem has been solved so quickly.. I’m really happy with your support, it’s simply the best I ever had on Themeforest ! Thank’s again for your great theme and your effectiveness. I’ll say that this is definitely the best out-of-the-box responsive, magazine style theme I’ve come across (and I’ve worked with dozens in the past few months alone). Just Purchased this theme. 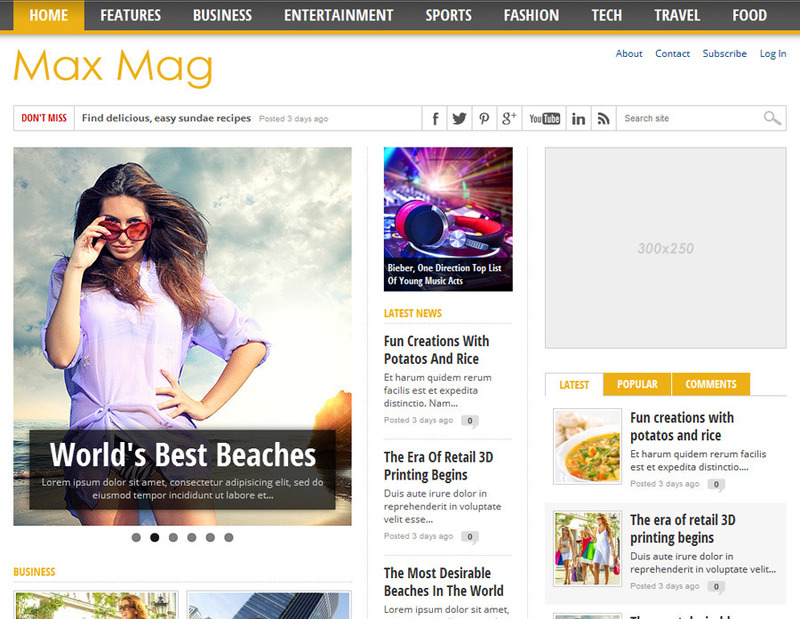 Best theme on Themeforest in magazine category. Great features. If anybody is looking for a theme in magazine/blog/news category. This is the best option. Just buy it. MVP Themes takes pride in its support! If you have any questions related to the setup of Max Mag that are not covered by the theme documentation or if you run into any bugs with the theme, please submit a ticket at the MVP Themes Support Center. 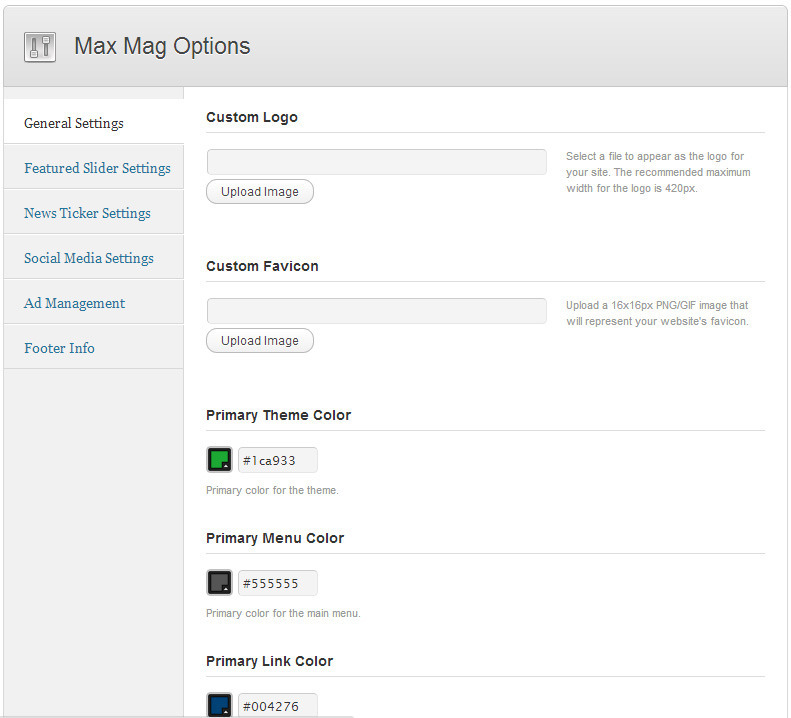 Unfortunately, MVP Themes cannot perform customization work for each of our customers, so Max Mag comes “as-is”. Any customization you would like to make to the theme outside of fixing bugs will need to be done by you or a third party. Adds Menufication plugin (fly-out mobile navigation)! Fixes bug related to Theia Post Slider that affected some installations. The plugin is now included separately. Existing users will now have to install it as a plugin. Added widget for Category Middle Widget area that displays latest posts of the category on the category page.